John and Lesley Brabyn’s Anatolian Shepherd, Tallulah, at 10 weeks old, gets acquainted with her future charges. While inherited instinct is the foundation of a successful guardian, early exposure to livestock is extremely important. The Kennel Club of Beverly Hills Dog Show in Pomona, California will be televised Easter Sunday on NBC affiliates nationwide. Almost two years old, Tallulah is just as much at home in the high-octane show ring as patrolling her 400-acre ranch in Sonoma County, California, for coyotes, mountain lions, or bobcats. 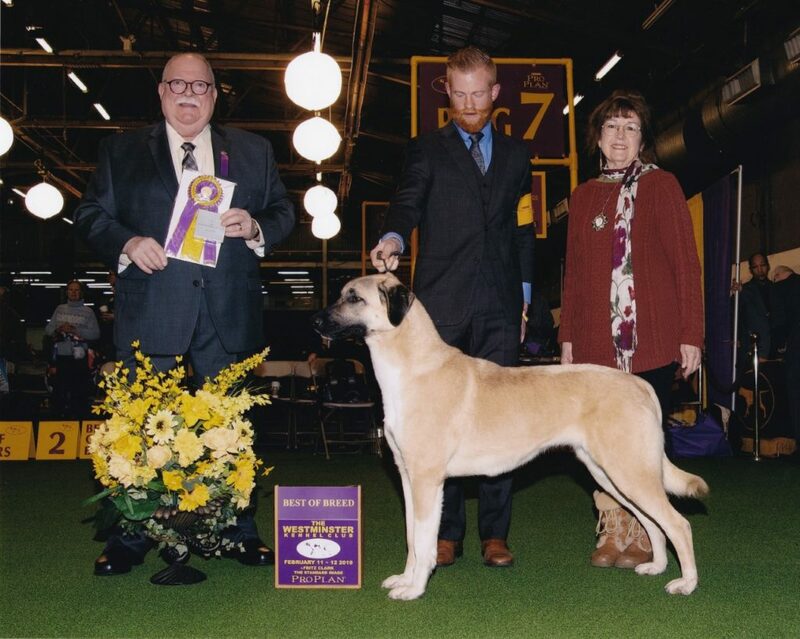 Whether it’s the glitz surrounding the Westminster Kennel Club Dog Show in New York City or the Kennel Club of Beverly Hills Dog Show in Pomona, California, the 100-pound Anatolian Shepherd has been making quite the impression. Tallulah is owned and bred by Lesley and John Brabyn, of Bodega, California, owners of Salmon Creek Ranch, where she is a working dog with an unblemished record – she has never lost a goat to a predator. Handled by Stuart McGraw, of Browns Valley, California (about 2½ hours from Brabyns’ ranch), the intrepid Tallulah took Best of Breed honors at both shows in polar opposite, but high-pitched environments. 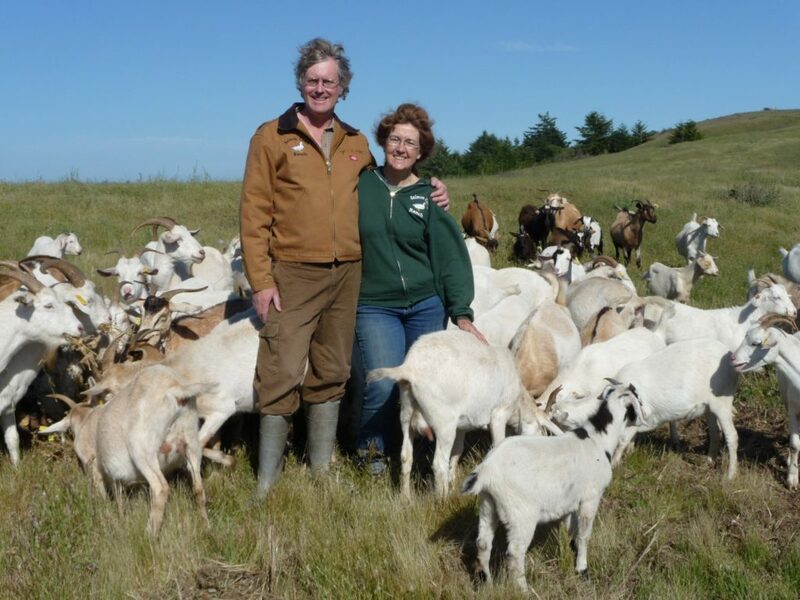 John and Lesley Brabyn are surrounded by their herd of Kiko meat goats, on their 400-acre Salmon Creek Ranch in Sonoma County, California. Photo by Jocelyn Brabyn. And her record in the show ring isn’t too bad, either. Lesley Brabyn showed Tallulah to her championship, which she earned from the 6-9 Puppy Class with several Best of Breeds over champions. But what are the challenges of handing off a tightly bonded working/show dog to someone outside the family? “Tallulah has always had a very sound and adaptable temperament,” replies Brabyn. “When Stuart first showed her, I was at the same venue showing Tallulah’s sire, which gave her a comfort zone. Tallulah has always liked people and been willing to work with others. She was the No. 3 Anatolian all-breed in 2018 and is off to a fast start this year with big breed wins at Westminster and Beverly Hills, plus eight more Best of Breeds and a Group 4 placement. Add to those impressive credentials, she earned her Grand Championship at the age of 19 months. Even with a half-century plus in dog sports, the couple had never been to the iconic Westminster until February. “Our son is in a PhD program at Columbia University and when we learned Stuart was going to be driving there, it seemed too fortuitous to pass by the opportunity,” says Brabyn. Judge Douglas Holloway, Jr awards Tallulah Best of Breed at the Westminster Kennel Club Dog Show in New York City in February. Handler Stuart McGraw stands alongside breeder/owner Lesley Brabyn. Photo by Fritz Clark. To make the Westminster experience even more memorable, Brabyn’s birthday was the next day. “It was the best present ever!” she beams. Prior to getting their first Anatolian in 2007 – a month after the couple purchased their ranch – the Brabyns bred and showed Salukis for more than a half-century – and still do. Their Salukis have excelled in the show ring, open-field coursing, lure coursing, racing, and obedience. “We want our dogs to adhere to the standard of the breed and still focus on what they were bred to do,” Brabyn emphasizes. Before purchasing the ranch, they researched what they could raise on the land, given the terrain, climate, and forage. Goats became one of their early choices, but it quickly became clear they needed a means to protect them from the nearby predators. But what breed would meet their needs? “The more we studied, the more we were convinced the Anatolian was the best choice. It quickly became integral to the agricultural operation. One of our first was Muhsin, Tallulah’s grandfather. He is still going strong at nearly 12 years old,” explains Brabyn. One of their first outings was accented with a physical – and psychological – conundrum involving Tallulah’s grandsire, who became a champion in only a few outings. The chief challenge was coaxing him into the car. The Brabyns neglected to teach him about cars when he was a puppy and it became nearly impossible to wrestle the 140-pound, 2-year-old inside. As a result, they missed the first show in which he was entered. Since those early days, the Brabyns have seen considerable success on the Anatolian show-ring front. Tallulah is no exception. How Do You Meld a Farm Dog into a Show Dog? Tallulah enjoys an endearing moment with a baby goat. The almost 2-year-old dog has matured into an outstanding livestock guardian, fierce when she needs to be and protectively nurturing with the little ones. Photo by John Brabyn. “Rather than formal obedience with our Anatolians, we concentrate on our relationship with the dog and what it will need to know in order to work on the ranch. 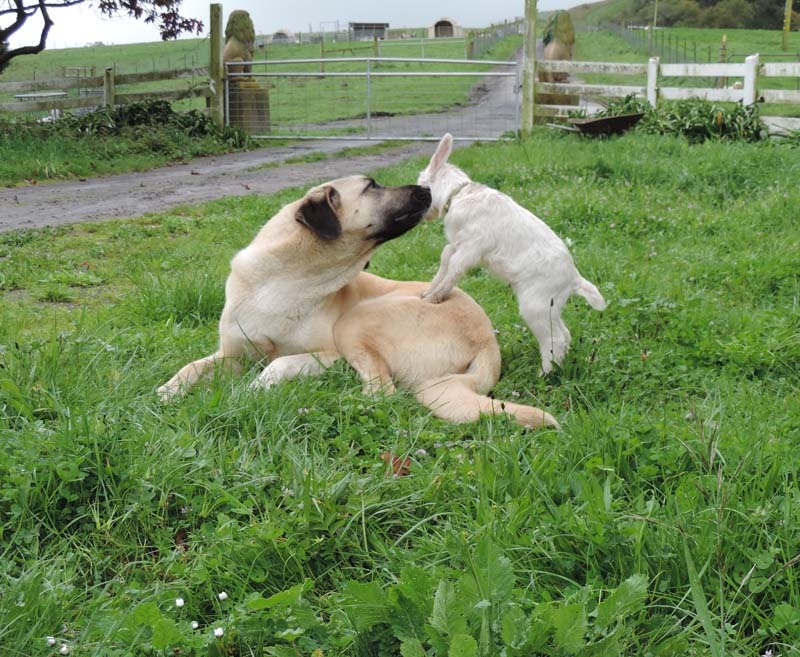 Lessons for a livestock working dog are more about shaping, rather than teaching specific behaviors. The instinct and respect for livestock has to already be there. Because they show their working dogs, the Brabyns allow a few minutes every few days with a pocketful of treats during chore time for their youngsters in training to learn the stand-stay and how to gait on a leash (usually one of bailing twine from the nearby truck) while making it fun. Once the youngsters understand what the owners want of them, the rest of their show training is handled at the show venues: getting them accustomed to the site; being around many other dogs; and doing the stand-stay with plenty of distractions about them. Tallulah, says Brabyn, was finished with show-training sessions on the ranch at about 7 months of age. Tallulah’s job description is guarding the owners’ herd of young doelings (a duty she shares with her brother), which means she lives with them 24 hours daily. The farm’s Anatolian population is seven, ranging in age from 12 to almost 2 (May 25). All are working, and five have Conformation Champion titles. Tune into the Kennel Club of Beverly Hills Dog Show on Easter Sunday, April 21, on NBC affiliates nationwide.